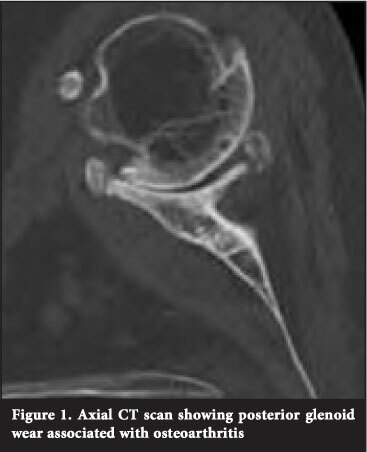 Recurrent instability or chronic dislocations can lead to an anterior or posterior glenoid rim defect and be associated with degenerative changes of the glenohumeral joint2 (Figure 2). Posterior glenoid wear may also be iatrogenic after surgery for anterior instability where the anterior capsular structures are over-tightened and lead to posterior humeral head subluxation. Advanced cuff tear arthropathy may cause flattening of the humeral head and superior glenoid erosion, as well as erosion of the under-surface of the acromion as a result of long-standing rotator cuff insufficiency and resultant proximal humeral migration6 (Figure 3). characterised by an equal balance of forces acting on the glenoid and a centralised humeral head. There is central, concentric glenoid wear. asymmetrical posterior force distribution on the glenoid and a posterior subluxation of the humeral head with or without excessive posterior wear. arbitrarily defined as glenoid retroversion greater than 25 degrees. This is mostly seen in dysplasias. Glenoid component loosening has been recognised as one of the more common aetiologies necessitating revision after TSR.7,13 Mechanical causes include a traumatic event, edge loading via a rocking horse mechanism in cuff-deficient patients, or fatigue failure.14 Polyethylene wear can lead to osteolysis and bone loss as a result of a macrophage response to particulate debris. Osteolysis is often a silent disease, and it can be quite common for patients not to have pain until the bone loss is very advanced. This response can lead to a massive loss of bone stock in both the proximal humerus and glenoid.15 Failure of a hemiarthroplasty due to severe glenoid erosion may also be a cause for revision surgery16 (Figure 3). 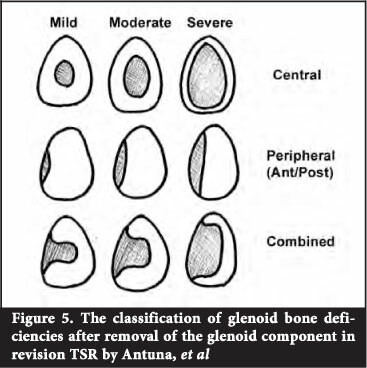 Antuna et al have classified glenoid bone deficiencies after glenoid component removal into central, peripheral or combined, each with mild, moderate or severe degrees of bone loss.17 The deficiencies were classified as mild if they involved less than one-third of the glenoid surface or rim; moderate if they involved between one-third and two-thirds of the surface or rim; and severe if they involved more than two-thirds (Figure 5). Most deficiencies are central or combined. This includes an accurate history, an examination and radiological investigations.5 In the history it is important to note the aetiology as it may give a clue as to the amount and location of bone loss. Post-traumatic arthritis and avascular necrosis are unlikely to result in significant glenoid bone loss. As mentioned earlier, osteoarthritis, inflammatory arthritis and cuff arthropathy all exhibit their typical patterns of glenoid wear. The most severe patterns of bone loss, including cavitary and uncontained defects, are seen in revision cases.  insufficient volume to support the glenoid component. Alternatively, the surgeon may decide not to resurface the glenoid but to perform a humeral hemiarthroplasty. 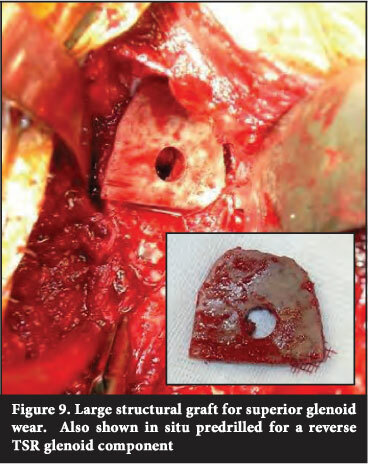 Some have advocated covering the grafted glenoid with a biologic resurfacing (Achilles tendon allograft, fascia lata, capsule).4 The soft tissue can be sutured to the perimeter of the glenoid rim using suture anchors much like an arthroscopic Bankart repair. This provides a means of containing the impacted graft material while also providing a smooth articulation for the humeral head.16 The results of this technique are conflicting in the available literature. Our limited use of this technique has not been encouraging in the past and we have abandoned it. With more severe glenoid wear and bone loss, especially in cases with a deficient rim, a structural bone graft is required. If autograft is desired, tricortical iliac crest autograft can be used21 (Figure 6). A femoral head provides a convenient source of allograft in that a sufficient volume of dense cancellous bone may be extracted and contoured while being typically available in most institutions7 (Figure 7). 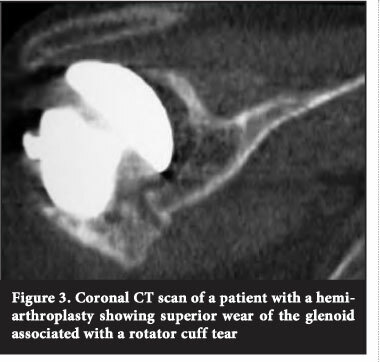 Neer and Morrison in 1988 were able to monitor 19 of 20 shoulders having a large segmental graft for eccentric glenoid wear.22 The patients were followed up for a minimum of 2 years (average 4.4 years). The clinical outcome was excellent in 16 and satisfactory in one. None of the glenoid components clinically loosened or moved, and none required further surgical treatment. 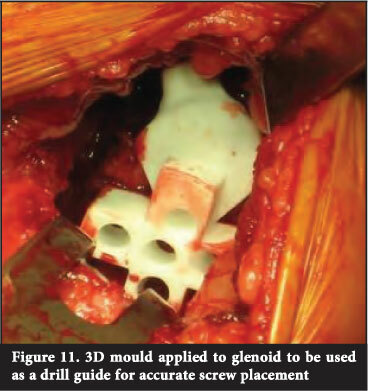 The authors commented that this technique provided sufficient osseous support to allow secure fixation of a glenoid component in the face of eccentric glenoid wear. However, the results of other reviews using this technique were not so favourable. 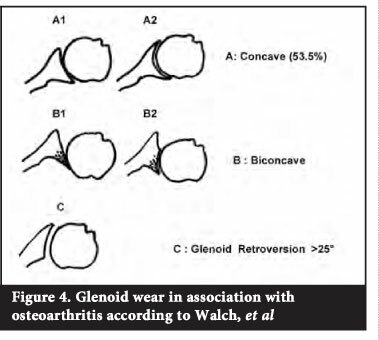 Steinmann and Cofield in 2000 reported 28 patients having glenoid bone grafting for segmental glenoid wear.23 Twenty-five patients had slight pain and three had moderate pain. Applying Neer's result rating, 13 shoulders had excellent results, ten had satisfactory results, and five had unsatisfactory results due to glenoid loosening in two, reoperation for instability in two, and persistent pain in one. Thus, in this series, four of 28 glenoids had not remained securely fixed, and the risk of recurrence of instability despite correction of glenoid component alignment was introduced. A review article by Gerber in 2001 reported poor results with this technique due to high rates of glenoid loosening. The high failure rate led them to reconsider hemiarthroplasty for such cases.6 It should be noted that even when performing hemiarthroplasty, the glenoid version and inclination should still be corrected with a structural bone graft or asymmetric reaming because the functional results of hemiarthroplasty for osteoarthritis with asymmetrical glenoid wear are inferior to the functional results of hemiarthroplasty for concentric wear.6,24 We have found in our own unit that hemiarthroplasty with bone graft from the humeral head tends to resorb, and now prefer tricortical iliac crest graft. Because of the small anatomic size of the glenoid, bony deficiencies frequently compromise component fixation and pose considerable reconstructive challenges. In many instances, the bony deficiency on the glenoid side could be complex and massive, which precludes placement of a glenoid component.16 When glenoid components fail, most often due to loosening with some degree of bone resorption, it may be possible to place a new glenoid component with or without some degree of bone grafting, which may be done in one or two stages. The addition of bone graft should be considered in any revision where glenoid defects occur.7 If a structural bone graft is used it should be of sufficient size to address the defect as well as normalise the version, inclination and offset (Figure 9). In 2006 a review was undertaken by three centres.21 Nineteen patients underwent reimplantation of cemented glenoid components, 12 glenoplasty with or without bone grafting, five reverse TSR, and one resection arthroplasty for infection. At a minimum follow-up of 12 months the Constant-Murley score improved in all patients. Cemented glenoid reimplantation led to considerably improved function. Conversion to a reverse implant in patients with cuff tears led to improved pain scores. Neyton et al reviewed nine patients undergoing revision to a reverse prosthesis in 2009.26 These patients underwent, in one or two stages, glenoid bone grafting and implantation of a reverse TSR. The indications for this procedure included revision shoulder arthroplasty and cuff tear arthropathy. At a minimum follow-up of 24 months most patients were satisfied with their results chiefly because of pain relief. A review by Antuna et al reported 48 shoulders that underwent revision surgery.17 Of the 48 glenoid components that required revision, 18 underwent removal of the component and bone grafting for bone deficiencies with no glenoid reimplantation, and 30 underwent implantation of a new glenoid component. At a minimum follow-up of 2 years there was considerable pain relief (86%) and improvement in range of motion in the group of patients who underwent revision of the glenoid component. The group of patients without a glenoid component was less satisfied than the group with glenoid reimplantation and pain relief was achieved in only 66%. Phipatanakul and Norris reviewed 24 patients who underwent conversion of a TSR to a humeral head replacement with glenoid bone grafting for glenoid loosening due to osteolysis.14 Of the 24 patients, 18 had satisfactory pain relief at a mean follow-up of 33 months. Four had good pain relief with conversion back to total shoulder replacement at a mean of 11 months after the index procedure. Two patients continued to report significant pain and were not satisfied with the procedure. They concluded that bone grafting of glenoid defects in revision arthroplasty provides satisfactory improvement in terms of pain relief and, by improving bone stock, allows for placement of a glenoid component at a later date if there is persistent pain. Elhassan et al retrospectively reviewed 21 patients who underwent glenoid bone grafting using corticocancellous bone grafting or impaction grafting using cancellous bone graft.16 Three patients underwent revision TSR, five patients hemiarthroplasty, ten patients hemiarthroplasty with biologic resurfacing of the glenoid, and three patients revision to reverse TSR for large rotator cuff tears. After a minimum of 25 months' follow-up all patients had improvement in their range of motion and the Constant-Murley score. Most improvement occurred in patients with glenoid reimplantation. They concluded that revision TSR with glenoid bone grafting can produce good short-term outcomes and glenoid component reinsertion should be attempted whenever possible. There is little literature analysing the results of a two-stage procedure where the glenoid component is removed and bone grafted and then at a later setting a new glenoid is implanted. In the setting where patients have undergone glenoid component removal and bone grafting but have persistent pain and limitation of movement this procedure may be considered.27 A review of seven patients was performed by Cheung et al in 2007.28 Five of the patients had reduced pain and expressed satisfaction with the result but two patients developed a low grade Propionibacterium acnes infection and underwent re-revision. They concluded that reimplantation of a glenoid component offers an improved clinical outcome in most patients, particularly reduction in pain and improvement in satisfaction. Anecdotally from meetings, discussion and our experience,29 failed conventional arthroplasty is more readily converted to reverse TSR. The reason for this is probably multifactorial. These failures are often associated with a dysfunctional rotator cuff due to tears, stiffness and fatty change of the muscle. Septic cases often have rotator cuff deficiencies and bone loss. The exposure of the glenoid is better when doing a reverse and therefore easier to bone graft. Good function is probably more reliably returned to the shoulder with the biomechanical advantage of the reverse TSR. The altered biomechanics of the reverse TSR probably allow better forces to act across the bone-grafted glenoid rather than across a glenoid of a conventional TSR, and therefore fewer failures are being seen. Loosening humeral component is rarely a cause for revision in shoulder replacement surgery. Similarly bone loss is also an infrequent cause for revision when compared to the glenoid component. 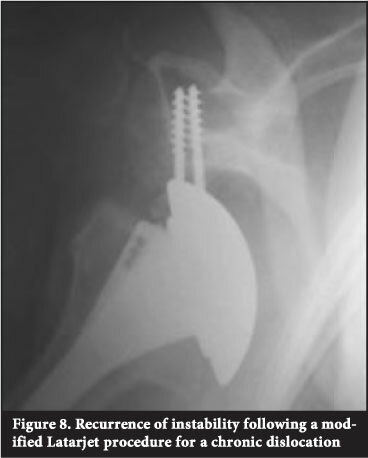 A 2010 study by Cil et al reviewed the survivorship of the humeral component in shoulder replacement surgery.30 They reviewed 1 584 cases of hemi- and total arthroplasty over a 20-year period. They found an 83% survival of the humeral component at 20 years when the end point was defined as humeral component revision or removal. Certain risk factors were identified as an increased risk for humeral component failure, i.e. young age, male gender, uncemented shoulder replacement, and replacement due to post-traumatic arthritis. 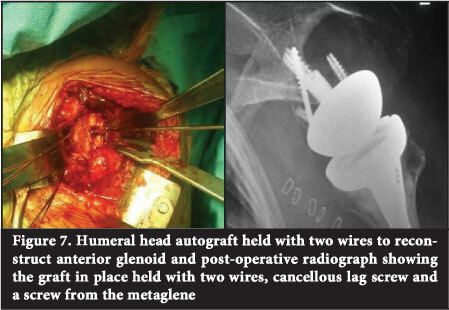 Their overall conclusion however, was that glenoid-related problems, glenoid arthritis in hemiarthroplasties and the glenoid component in total shoulder replacements are the weak links in shoulder replacement surgery, resulting in humeral component revision or removal. Verborgt et al evaluated the long-term results of uncemented humeral components at an average of 9.2 years.31 No complications or revisions occurred related to the uncemented humeral component. Of the components, 59% showed radiolucency, 32% had endosteal erosion and 14% had tilted. Of the humeral components, 19% were judged to be at risk for loosening. The prevalence of an at-risk humeral component was not associated with increasing pain or deteriorating function. There is a paucity of literature addressing the subject of humeral bone loss, mainly due to the fact that this problem is not commonly encountered. In cases of massive bone loss of the humerus due to multiple revisions, fracture and infection, a tumour endoprosthesis is an option. A case report by Wang et al describes a patient with severe rheumatoid arthritis who had multiple revision total shoulder and elbow arthroplasties, which were complicated by infection and fracture.32 The patient had a dysfunctional flail limb with progressive humeral and bone loss, which was treated with a total humeral prosthesis and a vascular mesh allograft. At 14-month follow-up the patient reported continued pain relief and good elbow function. Very often with these types of cases there is full rotator cuff loss. We have been using a reverse prosthesis combined with tendon transfers (latissimus dorsi), with the addition of suture holes to the custom prosthesis to try to restore some external rotation for these patients. Most of these are failed fracture fixations or a failed arthroplasty used to treat a fracture. The tumours are dealt with by the tumour surgeons. Arthroscopy can be a useful adjunct to both diagnosis and treatment in cases of suspected glenoid loosening. 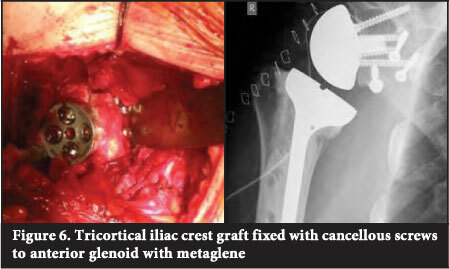 Namdari et al have had success with arthroscopically assisted removal of the loose glenoid and bone grafting of defects with cancellous allograft bone chips.27 Their indications for arthroscopically assisted glenoid removal and bone grafting are limited to aseptic loosening of the glenoid component with resultant contained glenoid defects. They state that this technique allows for a theoretically less morbid approach to conversion of a painful TSR to a hemiarthroplasty with restoration of glenoid bone stock, but is inappropriate in cases with severe capsular contraction, need for significant bony and soft-tissue reconstruction and balancing, or metal-backed glenoid components or in any cases in which the surgeon expects significant technical difficulty in accessing and visualising the glenohumeral joint with an arthroscope. We have limited experience in using arthroscopy for diagnostic and occasional therapeutic use in arthroplasty patients. We have not used it to remove glenoids yet, but certainly confirmed loose glenoids when there has been doubt. Although glenoid bone deficiency may preclude the placement of a traditional component, some investigators have looked towards the design of alternative glenoid components. A recent biomechanical study by Kirane et al in 2012 reviewed a posterior-step prosthesis that has been designed to compensate for biconcave glenoid defects (specifically type B2).33 Mechanical performance was evaluated based on periglenoid bone strains under consistent loading conditions in shoulder specimens. No significant difference was observed in the performance of the posterior-step prosthesis in the presence of a biconcave defect as compared with that of a conventional prosthesis in the absence of a defect. They concluded that this prosthesis may be a viable treatment option for posterior glenoid defects but further testing is required. Another emerging technique is the use of patient-specific instrumentation. Mulder et aí29 presented the results of a pilot study of the use of a jig designed from a CT scan-derived CAD 3-dimensional model of the scapula. This jig allowed correct placement of a metaglene glenoid base plate for a reverse shoulder replacement. The jig was tested on two cadavers and five patients. The post-operative CT scans showed the average centre peg deviation from the intended inclination was 5.7 degrees and the version 3.3 degrees from the intended position. They concluded that this shows good positioning, but added that the numbers were too small and a follow-up clinical trial is required. The pre-built mould (Figure 10) is placed on the patient's glenoid at the time of surgery and drill holes are then drilled through the predetermined holes in the mould to ensure accurate placement of screws in the glenoid (Figure 11). It has been well shown that correct placement of the glenoid is important to prevent notching and failure of the reverse TSR. 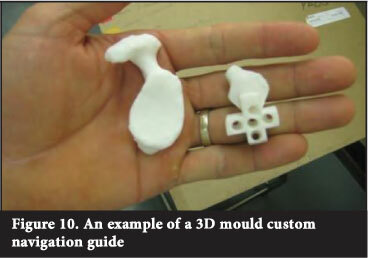 We are currently designing a mould for use in standard TSR as well. First, it should be clear to the surgeon and patient that these are complex and challenging cases and as such both parties should have realistic expectations. No criteria are yet defined in the literature as to the amount of bone loss required before bone grafting should be performed in both primary and revision TSR, but rather each case should be considered on an individual basis. Again in revision TSR there are no criteria available to guide the surgeon as to whether a glenoid can be reimplanted or not, either as a one-stage or two-stage procedure. However the studies reviewed consistently show better outcome scores (pain relief and satisfaction) when a glenoid is reimplanted as opposed to revising a total arthroplasty to a hemiarthroplasty. The reverse TSR in our hands seem to be more amenable to bone graft and reimplantation of a glenoid in revision cases. No benefits of any form have been received from a commercial party related directly or indirectly to the subject of this article. The content of the article is the sole work of the authors.